working longer and longer hours just to stay even. fallen from the Time-for-Money Trap. You know, a day's work for a day's pay. A month's work for a month's pay. Sound familiar? Whether you're a $10,000-a-year dishwasher or a $100,000-a-year doctor, you're still trading one unit of time for one unit of money. You're still living paycheck to paycheck. As for "job security" - if you can't do the work because of layoffs... illness... injury... or retirement - the paychecks stop! Where's the security in that? How do you escape the Time-for -Money Trap? By building pipelines of ongoing, residual income. With residual income, you do the work once and get paid over and over again. That's why one pipeline is worth a thousand paychecks. Pipelines keep pumping day after day, year after year, whether you're there to do the work or not. Now, that's security - true financial security! 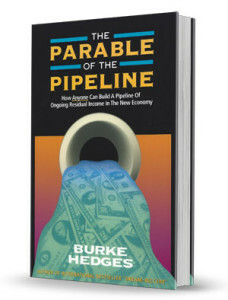 The Parable Of The Pipeline will teach you how to build pipelines so that you can make the leap from earning a living today... to enjoying a lifestyle tomorrow! 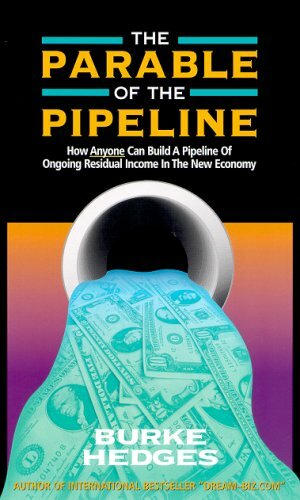 How to build a million-dollar pipeline on less than $4 a day! How to start living your dreams today by building a 5-year lifestyle pipeline, while planning for the future by building a 50-year retirement pipeline. Burke Hedges has championed the crusade for personal and financial freedom for more than a decade. To date, his seven books have been translated into 10 languages and sold more than 2 million copies worldwide. Burke resides in the Tampa Bay area with his wife and five children.